Hopefully, our road-trip will have a happier ending than theirs did. 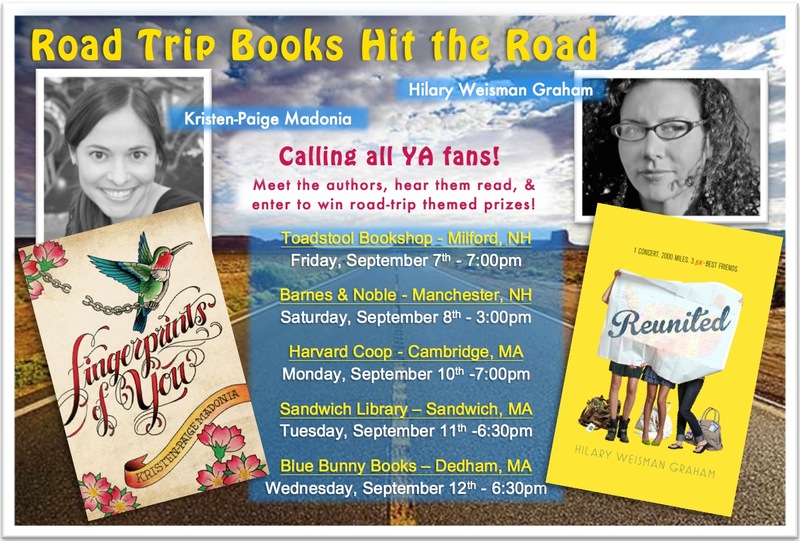 Tomorrow morning, Kristen-Paige Madonia & I kick off our Road Trip Books Hit the Road tour with two school visits (Pinkerton Academy & Londonderry Middle School) followed by a reading at the Toadstool Bookshop in Milford, NH at 7:00pm. Whew. I’m tired just thinking about it. Our plan is to rendezvous at the school, but until then, Kristen-Paige and I will be traveling in separate cars. I live in the middle of nowhere, so I tend to spend a fair share of my time alone in my car. So, I thought I’d share some of my personal must-haves for those long solo drives. 1. An apple. I never drive long distances without an apple in my car. For one thing, it’s the perfect food. Plus, when you’re done, you get to chuck the core out the window, which is an added bonus (location permitting). Then there’s my recent car apple discovery: even if you leave your apple in the car for a few hours and it gets really hot, it still tastes good! Like a crisp, single-serving, healthy apple pie. Yum. 2. Podcasts. The Moth, This American Life, the JV Club, Radiolab, Fresh Air. Take your pick. Oh, and did I mention that I’ll be performing live on the Moth Mainstage in October? Eek! (Details TBA). Hope to see you on one of our tour stops. And if you haven’t read Kristen-Paige’s book, FINGERPRINTS OF YOU, it’s poignant and beautifully written, with a complex protagonist you’ll come to care about deeply. One of my favorite reads of the year!